In an alley, a young man is approached by a gang of thugs that don’t take kindly to “fags”. They’re about to wreck him when Casey Jones appears. Casey beats all the thugs to a pulp and helps the young man back to his feet. The man introduces himself as Jim and asks if he could buy Casey a beer out of gratitude. Casey tells him that there’s a bar called Torchy’s just around the corner. Casey says that he was born in the Bronx and was the oldest of two sons; his younger brother being Davy. He and Davey got along for the most part, but Davy was always his father’s favorite because he excelled in both sports and academics. Casey, on the other hand, enjoyed graffiti art and reading comics, and though he worked out, it was only to attract ladies and never for sports. As Davy went on to become an all-star high school goalie, Casey dropped out of school and moved into his own apartment in a bad neighborhood (furthering the rift between himself and his father). Shortly after moving, Davy stopped by to invite Casey to his game that evening. Casey wound up erupting at Davy for being their father’s favorite and threw him out. Leaving, Davy said that it was their mother that wanted Casey to come to the game so that they could work things out. That night, Davy saved a number of goals and won his school the game. Watching Davy on TV, Casey felt proud (and guilty). After the game, Davy stopped by Casey’s place one more time to convince him to come to his next game. Not wanting to lose his family forever, Casey agreed to talk things out with their parents. As Davy left, though, he was attacked by a street gang and beaten into a bloody mess. 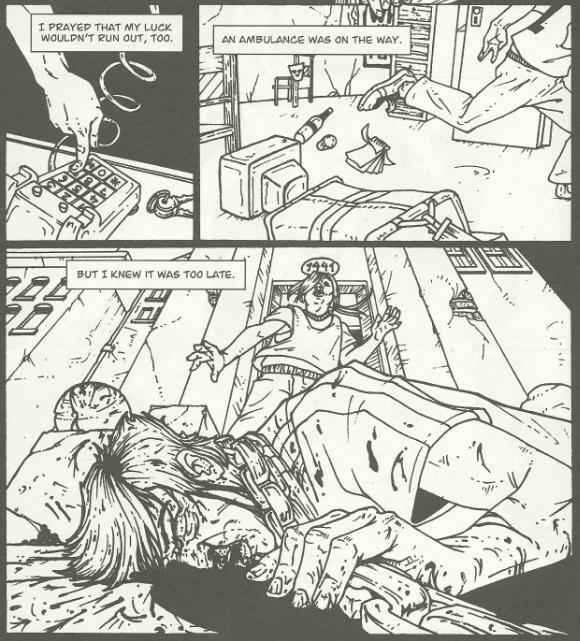 Casey immediately called for an ambulance, but Davy died from his wounds shortly after reaching the hospital. Blaming Casey for Davy’s death, Casey’s dad told him he never wanted to see him again. Casey then threw himself into the fantasy world of TV violence and found that the vigilantes like Clint Eastwood and Charles Bronson made a lot of sense. Putting on Davy’s goalie mask and grabbing his hockey bag full of equipment, he then took to the streets to get revenge on not only the gang that killed his brother, but all street gangs that prey on innocent people. Story time over, Casey spots some thugs following their target out of the bar. Jim says he still has so many questions for Casey, but Casey bids him good night, as he has work to do. The bartender, Jesse, has a good laugh at Jim’s expense. Jesse says that he’s known Casey’s family for years and that everything Casey just told him was a lie: Casey is an only child. Following Casey out of the bar, Jim watches as he puts the hurt on the thugs and wonders who Casey really is. *Chronologically, this story would have to take place before Casey gives up his vigilante career in “City at War”. I would place it after TMNT (Vol. 1) #21. *Casey takes Jim to a bar called Torchy’s. Casey mentioned having previously worked as a bouncer at that bar in TMNT (Vol. 1) #10. *Casey’s affinity for spray paint art was established in “Fun With Guns” and Tales of the TMNT (Vol. 1) #4. *Casey’s dialogue as he puts on Davey’s mask for the first time is the same (almost) as his dialogue in his first appearance in Raphael (microseries) #1. *Casey’s actual origin will be revealed in Tales of the TMNT (Vol. 2) #56. 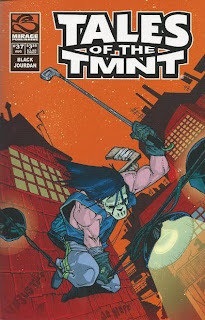 *Casey’s propensity for making up wild stories and getting carried away with his own imagination can be seen in earlier tales, such as “Casey Jones, Private Eye”, TMNT (Vol. 1) #14, Casey Jones #1 and Casey Jones #2. *In the letters page of Tales of the TMNT (Vol. 2) #34, Steve Murphy makes the claim that the soon-to-be-published Tales #37 would contain the "true origin of Casey Jones". He was either misinformed about the actual issue or this was some deliberate misdirection. 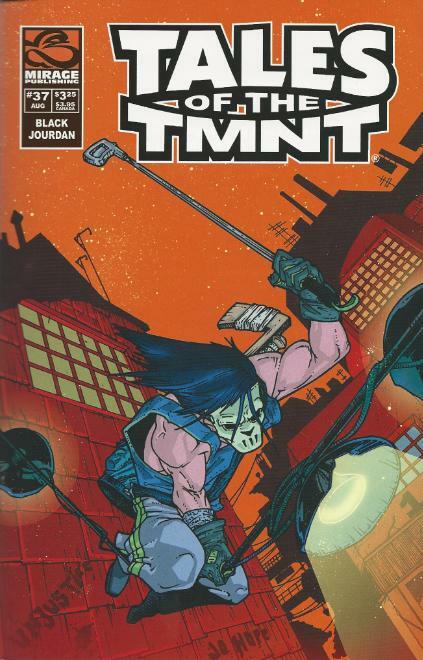 *With this issue, Steve Murphy stepped down as managing editor of Tales of the TMNT and was replaced by Dan Berger for the remainder of the run. 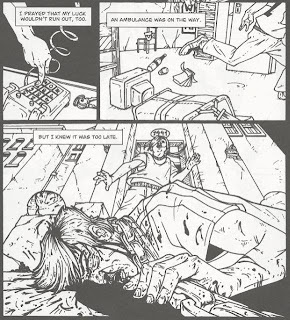 Author Jake Black illustrates just how well he knows the character of Casey Jones by spinning a yarn woven from as many of Casey's obscure attributes as possible. Black resurrects a number of Casey’s forgotten traits, such as his time working at Torchy’s and his love of spray paint art, but more importantly, he brings back Casey’s love of telling tall tales and getting lost in his own imagination. It’s a part of Casey’s personality that’s been around since the Eastman and Laird days (most famously in “The Unmentionables”), but few writers proved willing to run away with the concept, preferring to focus exclusively on Casey as the hard-drinking, badass street fighter. And that’s why “Casey in Point” works so well for me, as it casts the spotlight on a rather underdeveloped part of Casey’s character that helped him feel more multi-dimensional in the early years of the Mirage books (he later devolved into a parody of himself after they robbed him of his more artful and creative quirks in exchange for the “kickass vigilante” shtick). So far as origins go, this one could have worked perfectly well as the real deal if Black had felt the urge to drop the twist ending. There’s little contradictory about Casey’s history here (while Casey’s relationship with his father is shown to be rocky, his relationship with his mother remained strong, which works with “City at War”) and, like I said, Black dug up more than enough nuggets from Casey’s classic appearances to make the whole thing feel perfectly authentic. I suppose the only tip-off that this was an imaginary story was the fact that Casey putting on the mask for the first time and getting revenge on the street gang that killed Davy was supposed to take place at the same time as his first appearance in Raphael #1, though the events (and Casey’s ages) don’t align quite right. Of course, I remember reading this for the first time in 2007 and feeling a bit ripped off. I was a bit perturbed about having the rug pulled out from under me by the ending and so I failed to appreciate the fact that this was intended more as a character study than a definitive origin. We later got our Casey origin in Tristan Jones’s “Gang Wars” arc, so I can’t imagine anyone should still hold any ill will toward this story for its “gotcha” ending. Diego Jourdan’s art has a rough quality to it, but I think that works just fine for the type of gritty, urban tale being told here. While I felt at times he overly defined Casey’s face in the flashbacks (he’s supposed to be many years younger, fresh out of high school, but you wouldn’t be able to tell by looking at him), Jourdan’s layouts are strong, particularly his “camera work” (I dunno why, but I love the angle on Page 8, where we look down at the dinner table from above the ceiling fan). One of the elements he uses in a lot of his panels is foreshortening and he has a serious knack for it. A lot of artists struggle with that perspective, but Jourdan employs it well and it makes his panels really "pop". Lastly, I think a little toning might have been appreciated, as everyone ends up looking Caucasian even when the line-work is trying to say otherwise. “Casey in Point” is one of those stories I remember hating the first time around and was happy to rediscover on this most recent read-through. Being better educated on my Turtle history now than I was in 2007, I appreciate all the research Black did into the character’s background and less-referenced traits and quirks. 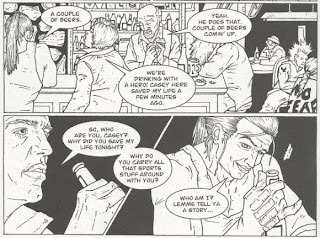 It provides a great fusion of the “badass, beer-chugging vigilante” Casey with the “hyperactively imaginative goof-off” Casey and he feels like a more well-rounded character than usual. I'm reallly glad for the last moment twist. I found this 'origin' to be really stereotypical stuff, by the numbers. But as made up story by Casey, it fits perfectly. It's like playing RPG and giving you character a sad backstory, based a ona movie you watched last week. It's really Casey thay way.